Some have asked what is the point of postprocessing images. Here is an example of why I shoot in RAW and postprocess afterwards. This image was taken in RAW+JPEG mode so that I had a RAW and a JPEG image to work with. 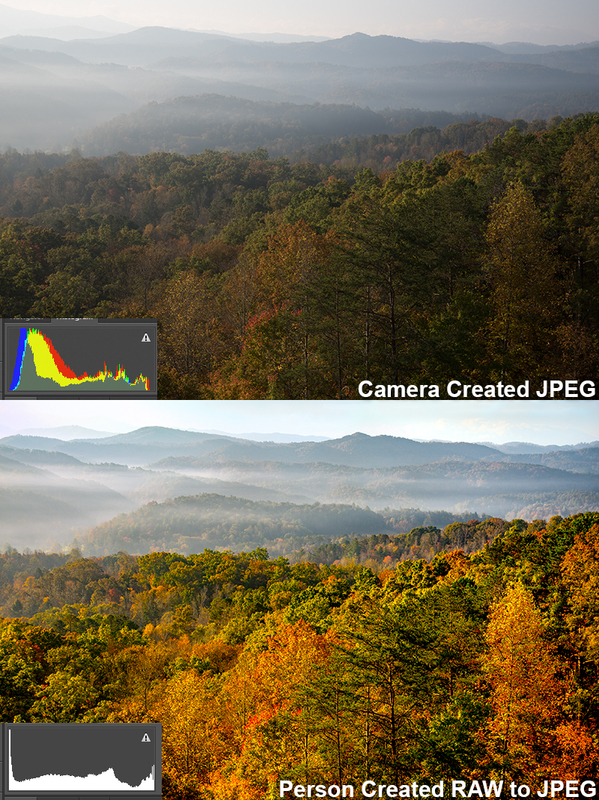 The image on the left is a camera-created JPEG, with no postprocessing—the famous SOOC (straight out of camera). 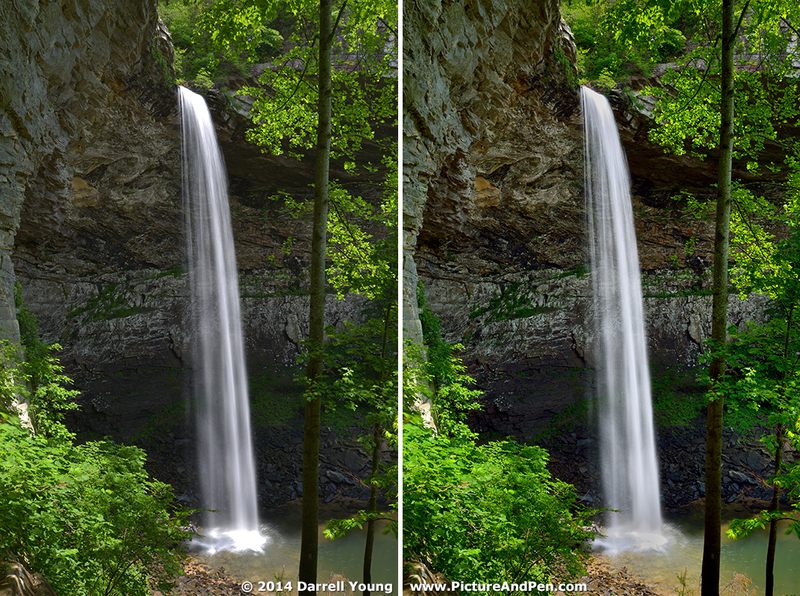 The image on the right is a RAW image after minor postprocessing and conversion to the final JPEG. (Shooting specs: Nikon D800, AF-S Nikkor 24-85mm f/3.5-4.5G ED VR lens at 34mm, 0.3 sec at f/14, ISO 50, on tripod, with Hoya HD circular polarizer, SD Picture Control). Notice how my interpretation is quite different from the camera’s? That’s the point! Camera-created images will rarely have the snap of a postprocessed image. Notice how I have pulled a bit more detail out of the water, where the camera burned it out. RAW images simply have more “headroom,” or the ability to access a larger amount of highlight and dark image data. At the same time, I selectively raised the brightness, increased contrast, and added a small amount of extra saturation to the colors. If you had done the brightness and contrast increase as a global operation on a JPEG, the background would have improved, but any detail in the water would have been obliterated. Years ago, I didn’t like using flash. I told everyone that I just liked natural light photography. Secretly, flash was never one of my strong points in photography. Later, I learned how to use flash and suddenly, I found I really enjoyed flash photography. I honestly feel that shooting RAW and then postprocessing is similar. Many photographers don’t have the tools or know how to do serious postprocessing, other than global adjustments. Therefore they don’t “like” post processing. Later, they aquire some good software tools, learn some techniques, and finally understand the limitations of SOOC. The camera’s built-in software can rarely give you an ultimate picture, for the simple reason that the camera is an averaging device. It wants to make things as average as possible. Unless a person seriously tweaks their Picture Controls, or uses full manual, the SOOC image is created according to the standards of the software programmers at Nikon. 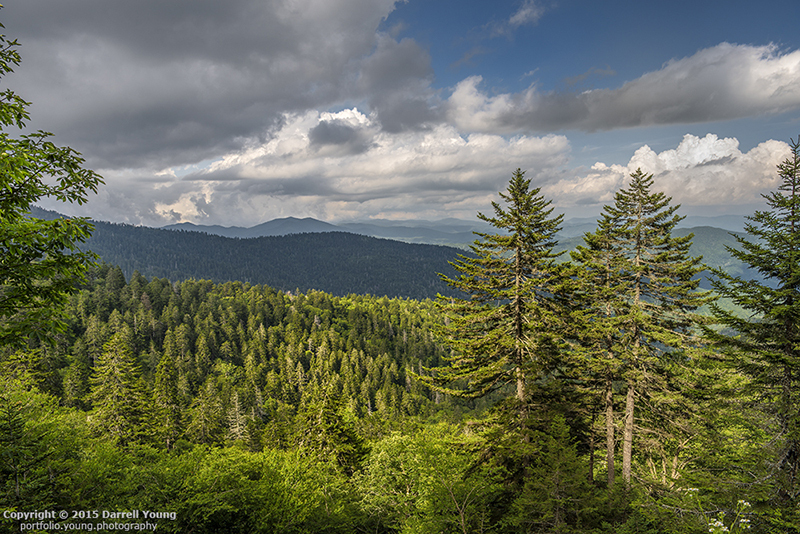 A scenic view of the Great Smoky Mountains from just below Clingman’s Dome. This is in North Carolina looking back into Tennessee. RAW to JPEG conversion. Nikon D810, AF-S Nikkor 24-70mm f/2.8 G ED lens. The human eye can probably see twice as much dynamic range as even the best of production cameras. Therefore, no JPEG image can even come close to capturing the full range of what the human eye can see. There must be a way to add to that dynamic range to make it closer to what a human can perceive. The RAW image, with its greater “headroom,” contains significantly more detail to call upon. When converted to JPEG, the image can contain a better representation of what the human eye initially saw. Therefore, in reality, a postprocessed image is more accurate than any JPEG image can possibly be. I know these are fighting words to some; however, other than photojournalists who have no time to postprocess images, the majority of fine artists postprocess their images for a serious reason. To capture reality more closely to what they perceived with their own eyes. (Shooting specs: Nikon D2X, AF-S Nikkor 24-120mm f/3.5-5.6G ED VR lens at 24mm, 10 seconds at f/22, ISO 100, on tripod, with Hoya HD circular polarizer, Nikonians ANPAT 2006). 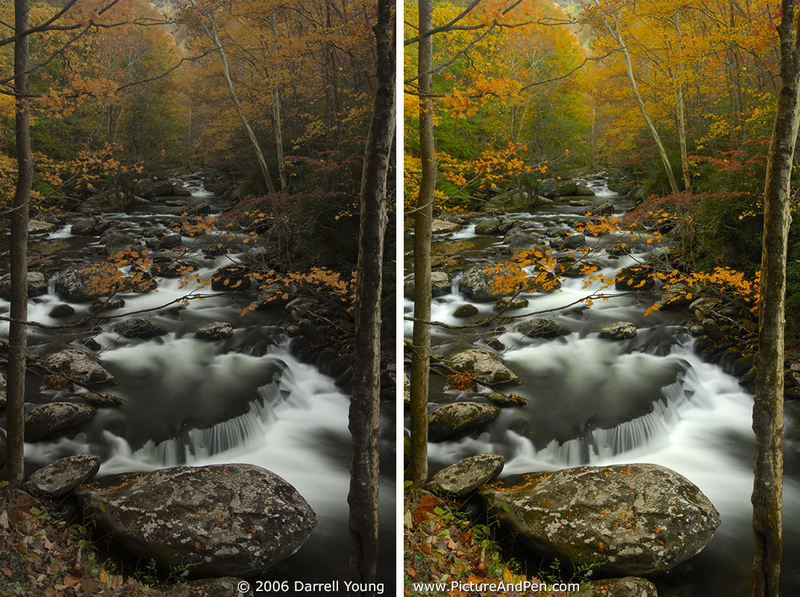 This is why many photographers—especially landscape artists—shoot in RAW and postprocess the image. You have more detail to work with and the final JPEG image can look better after postprocessing. To me, limiting oneself to just taking pictures is not completing the process. The camera is making the decision about how the image will look. You can influence that decision greatly by tweaking the settings of the Nikon Picture Control being used. However, many SOOC shooters don’t do that. Instead, they will rely on the camera’s exposure algorithms, as created by some software guy or gal in Japan. While a knowledgeable photographer can certainly make a JPEG sing and dance, by tweaking internal camera settings; doing so is no different from postprocessing. It is, instead, preprocessing! SOOC is not the end all for many of us. It limits one’s control over how the final image will look and usually is not a true representation of the reality. Why let the camera decide what looks best? The Japanese programmer who wrote the exposure code for the camera may not even be a good photographer! Do you really want him or her to create your pictures in-camera? 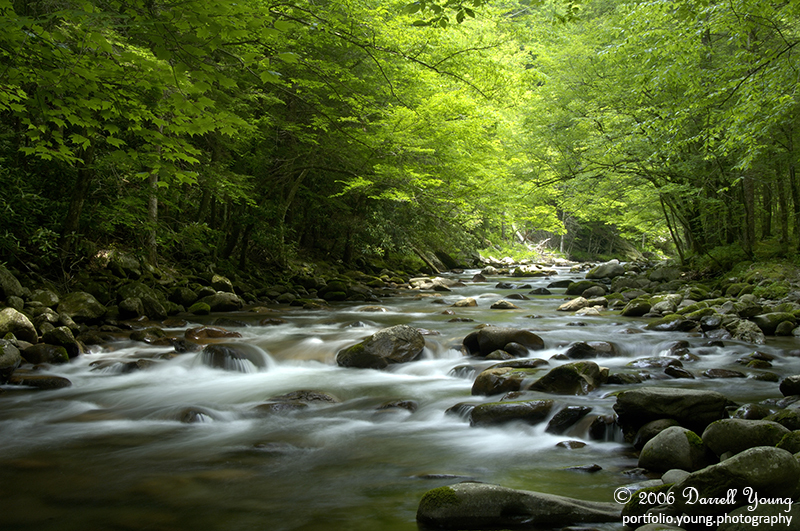 Cascades in the middle prong of the Little Pigeon River in Tremont of Great Smoky Mountains National Park, Tennessee, USA. RAW to JPEG Conversion. Nikon D2X, AF-S Nikkor 24-120mm f/3.5-5.6G ED VR lens. Camera-created JPEG vs. Person-created (me) JPEG from a RAW file. The two images above are from a RAW+JPEG pair. The top image is a camera-created (SOOC) image with no postprocessing. It is properly exposed, as shown by the histogram. The image on the bottom of the pair is a JPEG that I created by manipulating a RAW file and finally saving it as a JPEG when done. While I could have arrived at a somewhat similar image from the camera-created JPEG, I would have been working with a file having baked-in values that make my job a lot harder. Plus, the image quality would have been much lower in the end due to recompression losses and the problem of working with much less color data in the first place (see this article about color data). For those who derive great pleasure from not only snapping a picture, but also finishing the picture in a digital darkroom, shooting and using RAW files are the proper course. I guess it all boils down to this: do you want to allow your camera to create your pictures, or do you want to create your pictures? I choose to create my own work! Darrell, in my opinion, your photos say it all; if you want control over your final output, shoot RAW & process it to your liking. After all, it IS your photo. Thank you for all of the wonderful information you provide, I have read many of your articles and books. I recently purchased “Mastering the Nikon D7100”. Wonderful information! Thank you for your explanation and clarification of SOOC. Every camera setting and altered Jpeg camera setting is considered SOOC by those that do not understand post processing. Raw information is just that, digital information captured by the camera sensor without adjustments. If SOOC Raw images were published “as is” photography would be a bland… flat form of art. Art, whether it be one’s perception, painted on a medium and published as Giclee prints from a printer or other mediums and then claimed to be the only form of true art is left to interpretation . Images captured in Raw (unadulterated digital information) and altered in post processing is one’s perception of art just as those that painted on canvas, it is art left to interpretation. So let’s be considerate of all artist, whether it be Plein Air artist or Watercolor artist or Multimedia Artist or Digital Artist and let the art stand on it merit. Thank you for buying my book, Mac. I hope you enjoy it. SOOC has its place, for those times where a JPEG will work fine. However, for maximum quality, detail, and dynamic range, a camera-created JPEG image does not compete well with a hand-crafted RAW to JPEG conversion. Thank you. As a relative beginner, in a world in which appreciation for the number of jpegs I can get of birds in flight in JPEG versus RAW/NEF when shooting in Continuous-High is important, I have found your insight invaluable. I have found I can flip back and forth speedily, appreciate the flexibility of Nikon Raw/NEF and the speed of JPEG with Continuous-High. Someday perhaps, when I have a higher-end camera, I’ll do it all like a pro. For now, I do what I need. But, your guidance here and in various Facebook forums, give us all something to which we can aspire. Thank you. 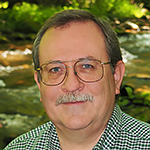 Thank you Darrell–straightforward, precise info that is easy to digest. Darrell i always enjoy reading your work . I have one question , what I would like to see is a JPEG before and after post and also the same pic in RAW before and after. This would help me understand the difference in why i should shoot RAW . It is impossible to display a RAW file in this article, Mike. Therefore, I extended the article with a new comparison of a JPEG with a RAW to JPEG conversion, including the histograms for exposure info. Darrell, very happy with your Nikon books. Cannot find answer to one small question. If I were to set it to say landscape for the JPG would that detract from the camera histogram which I want to be close as possible for the RAW file? ie is it best to leave camera set to SD Picture Control? My concern is only the histogram in camera, I know that the NEF Picture Control can be changed later.